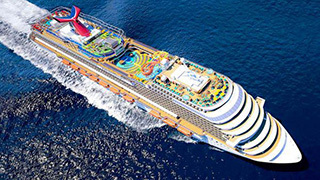 The 26th ship in the Carnival Cruises fleet is the sibling to the two-year-old Carnival Vista. The ship was absolutely "ready for prime time," and it delivered the ‘Fun,’ which has been Carnival's mantra for decades. At 133,500 gross tons and a lower bed count of 3,954 guests, Carnival Horizonoffers up a space ratio of 34, the same number as Carnival Vista. During the course of my cruise, the ship was really jumping, but I never felt any real sense of overcrowding, except for the normal pre/post-show and dinner times. In fact, even though the ship was virtually full, compared to previous experiences including aboard Carnival Vista, it never felt that way, even at lunch time at Guy Fieri's Burger Joint and the Lido Cafe. I'm not sure how Carnival managed this trick; maybe it's because there were so many really good options for complimentary dining, especially at lunch, that the crowd was spread out, even during our one day at sea. Dr. Seuss: Will I have Fun, On a Boat? Yes, there's still the Dr. Seuss Green Eggs and Ham Breakfast (small surcharge) available at the Reflection Restaurant, but what's new in Whoville is a Dr. Seuss-themed waterpark, which is really fun, with Dr. Seuss characters all around and the famed red and white striped design. 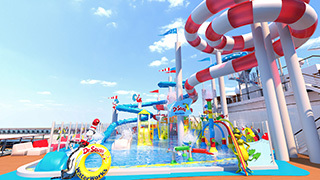 It's got two multi-deck waterslides of varying thrill levels plus a short one-decker for the little folks. In addition, there are Seuss interactive story times, a character parade, even a reading and play space called Dr. Seuss Bookville. Whether for the complimentary outdoors spread on embarkation and sea days or the more extensive offerings at the new specialty restaurant in the evening, Guy's Pig & Anchor Bar-B-Que Smokehouse is a great addition. 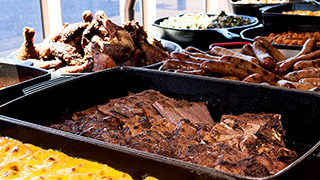 Naturally, the main evening a la carte offerings are meats: pork, chicken, brisket, sausage. All kinds of sauces and sides are available (the mac 'n' cheese, slaw, and potato salad seemed to be favourites). Prices were quite reasonable for the quality and quantity. Most entrées are priced at $8-$12. The sides are $4 apiece and the combo shared platter is $16. The Pig & Anchor experience is strengthened by having a bar that's open both afternoon and night, featuring craft beers brewed on board and live music during the evening hours. Its central location, adjacent to the ship's brewhouse, makes for a very convenient gathering place. Located adjacent to the Bonsai Sushi restaurant is the new Teppanyaki spot. Looking at it from an occupancy viewpoint, this may be the most in-demand dining area. There are two large Teppanyaki grill tables for up to nine guests with three time slots per night. So, on a seven-night cruise, it can seat at most 378 guests; clients should be advised to make reservations in advance or very early in their cruise. The menu offers multiple appetizers and desserts that all guests receive, and steak, chicken, lobster, or shrimp for the main course. Pricing ranges from $25-$30, which seems quite fair for the portions served, and of course the chefs put on a fun show as they cook right at each table. There are new menus in the Fahrenheit 555 Steakhouse, Cucina del Capitano Italian Restaurant, and even the Deli (part of the Lido complimentary restaurant). For the steakhouse, the list of choices (all part of the $35 per person set price) is extensive, especially the appetizers. And for dessert, there's a really unusual option called Art At Your Table which requires servers to perform one of the most artistic tableside techniques I've seen at sea. The servers paint the table top and then add in various ingredients to the selection. At fancy spots ashore, that one dessert item would cost as much as the entire meal at Fahrenheit. At Capitano, where the portions are large and served family style (great for larger groups), the appetizer and entree choices are vast and at $15 per person, another great value. This ship offers the fastest Internet connectivity in the fleet, and the new hub app gives guests ways to keep track of their schedules and multiple other options. One interesting new feature is the Smart Elevators. Guests press the desired floor destination on electronic screens in the two elevator lobbies and the "brain" picks out which is the best elevator for them to use (no changes can be made once one gets in the elevator). It does take a little getting used to but it works out fine. Guests noted it slowed things down a bit, especially on embarkation day. But CCL had staff in red shirts teaching passengers what they had to do and that helped out. Some didn't see the reason/need for a smart new system, but nothing serious. It's an adjustment for many people after a lifetime of doing it a different way. While there are no current plans to retrofit old ships with this new elevator technology, it will be on Carnival Panorama, the line's next new vessel. Also, I was really impressed by the electronic hand-held electronic tablets that made embarking and disembarking really fast and efficient compared to the old way of stanchion type machinery used in the embarkation area. It just seems easier for Carnival staff to scan the bar code on the plastic room key. During the course of the cruise, I took in the three new production shows. They all ran about 40 minutes and featured colourful costuming and graphic interactive walls. Singers and dancers performed a wide variety of popular music, mixing in current songs and older ones, most notably in the show titled Vintage Pop. For a couple of the shows I sat next to a 30-year-old and we went back and forth naming the newer pieces (her) versus the ones from earlier eras (me). For all three, the sound and lighting systems in the main show lounge were quite good, extending all the way to the back of the upper level. Europe is so strong with sales and pricing this summer that it was a little surprising that Carnival did not keep Horizon in Europe for the summer, as they did with Vista when she came out two years ago. The deployment decision was made before the hurricane season of last year. But there are other factors. With the Caribbean attracting new tonnage this summer and in the years ahead, capacity-leader CCL likely felt the need to place its best tonnage in the market to fend off the ever-growing competition. "We do very well in the U.S. market, it's our area of greatest demand and that's why we have so many of our itineraries in the Caribbean," Carnival President Christine Duffy said in a press conference onboard Horizon. Indeed, the additions on Horizon strengthen the fun ambiance already created by features on Carnival Vista (Skyride, IMAX Theater, etc.) that are well-suited for the Caribbean market. With Vista-class, Carnival is clearly moving forward with major hardware and software changes. And with Horizon, Carnival has truly put its best foot forward for its prime market.